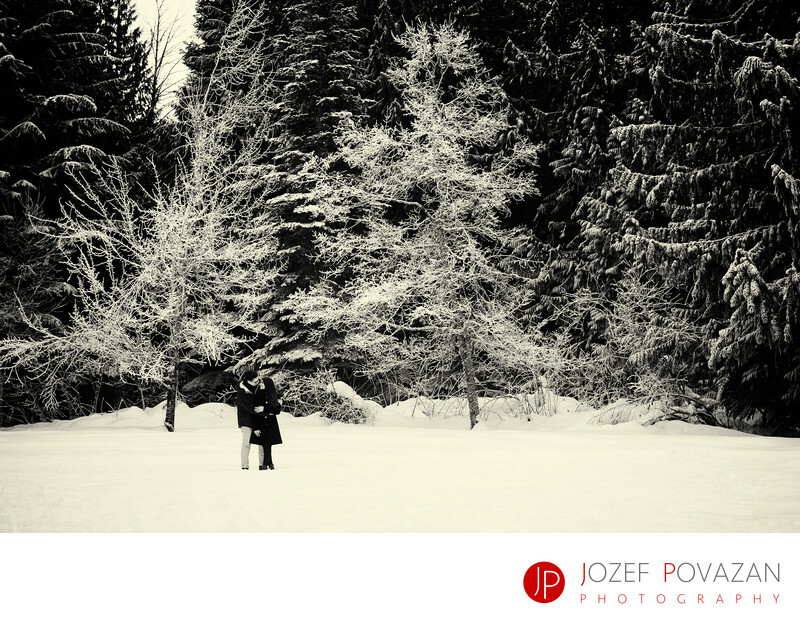 Whistler secret engagement proposal photography - Best Vancouver wedding photographer Jozef Povazan Photography studio. Whistler wedding photographer Jozef Povazan captures a secret engagement proposal at winter wonderland. Lost lake trail became a perfect place for Yes I Do answer from S+J date here. Couple flew from Miami for their winter snowboarding holiday with a bit of a secret. Sebastian reached out to me couple weeks before the trip if I would help him to capture his secretly planned proposal to his girlfriend Joanna. Well it took couple handful emails with logistics ideas. Then we changed those couple times accordingly to the weather conditions. I was absolutely amazed how these guys were connected. Genuine love at first site.The secret part of proposal was not easy to photograph since we have never met before, we chosen the exact spot for that part just an hour before the shoot, and they have never been in Whistler before so talk about logistics and shivers running down our spines. I had to crawl in snow up to my but to get through tough terrain and then hide not to be seen by Joanna until the question has been asked and the YES was said, and to make it more real, I still held back for extra minute or two since she was so happily shocked and in love I just did not dare to show her yet they were being photographed. They were so natural together that me as a photographer who loves to photograph candid moments and create modern fearless images would not be able to give them a better ideas what to do for those portraits after... They simply rocked the whole session and lived it like I was their best buddy who just happened to do couple selfies on iPhone from one of the most mesmerizing proposals I have ever photographed. I am literally blessed to witness and capture moments such these and I thank to you my friends who somehow keep finding me and are willing to step in front of my lenses to have their lives documented. Thank you for stopping by to all of you who like these kind of stories and if I can help you to capture yours I would be honoured to hear from you. Our CONTACT page has all info you might need to know to do so :). Location: Whistler, Lost Lake, BC, Canada. Keywords: whistler engagement (3), whistler proposal (3), whistler wedding photographer (6).